In ‘Around The Table,’ we highlight member news and share information on industry trends. This week, we shine the spotlight on Boeing and Wells Fargo. 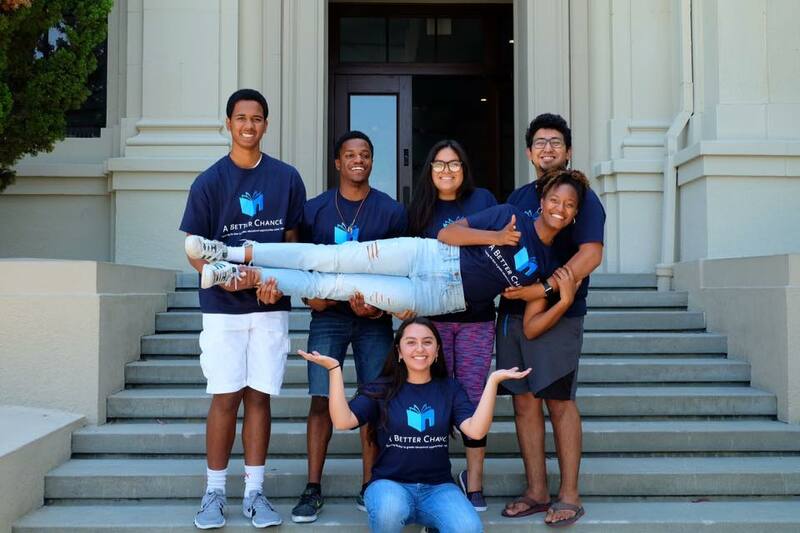 Boeing recently announced an additional grant award of $350,000 to “A Better Chance” (ABC) – a nonprofit organization working to increase the number of well-educated young minorities in the United States. Grant dollars will help fund the College Preparatory Schools Program (CPSP) and Alumni Relations program. “This additional investment, along with our previously announced commitment, will help lift up our young people and in turn improve our local communities,” said Tim Keating, executive vice president of Government Operations at Boeing. “Our relationship with ABC is stronger than ever, and we hope this show of support enables the organization to further its impact, bringing educational equity to children across the county.” Learn more here. 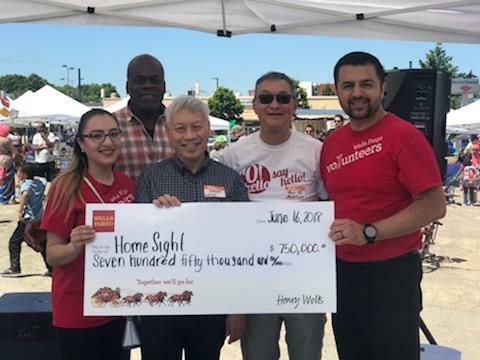 HomeSight and the Rainier Valley Community Development Fund announced nearly $2 million in grants and lending capital from Wells Fargo at the Summer Othello-bration event on June 16th. The funds will be used to help improve the Othello/Rainier Valley community and create more diverse small business ownership in South Seattle. Wells Fargo is working with HomeSight and its South Seattle community partners On Board Othello, Rainier Beach Action Coalition, and the Multicultural Community Coalition to implement a comprehensive, resident-driven neighborhood plan that includes a meal program for seniors, technical assistance for neighborhood small businesses, and an online media clearinghouse. Learn more here. The Washington Roundtable is pleased to welcome five new members to serve on our board: Brent Beardall, President & CEO of Washington Federal; Tod Leiweke, CEO & Team President, Seattle Hockey Partners; Kerri Schroeder, Commercial Credit Executive, Bank of America; Michael Senske, President & CEO, Pearson Packaging System; and Steve Singh, Chief Executive Officer and Chairman of the Board of Directors, Docker Inc. These members bring decades of leadership experience that will greatly serve our board as we tackle some of the biggest challenges we’ll face as a state in the coming years. Welcome aboard! 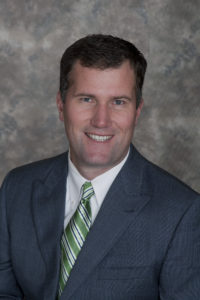 Brent Beardall is the President & CEO of Washington Federal, a national bank headquartered in Seattle, Washington. The company manages $15 billion in assets and 240 offices located in eight western states. On April 1, 2017, he became only the sixth CEO in the bank’s 100 year history. Beardall joined Washington Federal in 2001 as Vice President & Controller. In 2003, he was promoted to Chief Financial Officer, a position he served in for eleven years, until being named Chief Banking Officer, where he was responsible for all client-facing activities of the bank he was awarded the title of President in 2016. 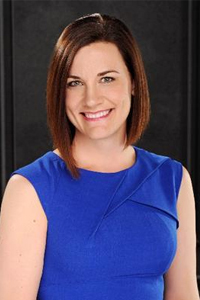 Beardall received a Masters Degree in Professional Accounting from Brigham Young University and is a licensed Certified Public Accountant in Washington State. He completed Stanford University’s Executive Program in August 2013. In 2012, he was recognized as “CFO of the year” by the Puget Sound Business Journal and currently serves on the boards of the United Way of King County and YMCA of Greater Seattle. He lives in Sammamish with his wife Jennifer and children Thomas (19) Caitlyn (17) and Jack (11). 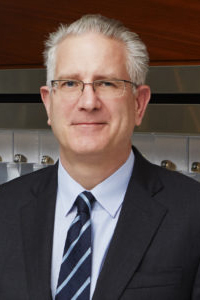 Tod Leiweke is the Chief Executive Officer (CEO) and team president for Seattle Hockey Partners. Leiweke is responsible for building a world-class NHL franchise, in anticipation of Seattle being awarded an expansion team. He will also be responsible for the redevelopment of the Arena at Seattle Center. Prior to being appointed CEO in April 2018, Leiweke served as Chief Operating Officer of the NFL for three years. From 2010 to 2015, he served as the CEO of Tampa Bay Sports & Entertainment where he was responsible for all business operations of the Tampa Bay Lightning and Amalie Arena. During his tenure, the Tampa Bay Lightning progressed from non-contender to Stanley Cup Finalist. Previously, Leiweke was the CEO of the Seattle Seahawks and Vulcan Sports & Entertainment where he oversaw all business and administration functions of the club. In his final season with the Seahawks, Leiweke played an instrumental role in recruiting Pete Carroll and John Schneider to the Seahawks, which resulted in a 2014 Super Bowl win. He launched the Seattle Sounders FC, which set the standard for all Major League Soccer teams to follow. Tod also led the King County United Way 2009 Campaign that reached the goal of over $100 million dollars raised. That campaign was capped with a climb, and summit of Mount Rainier with NFL Commissioner Roger Goodell. Kerri Schroederis the West Region Commercial Credit executive for Bank of America’s Global Commercial Banking and Business Banking groups. In this role, Schroeder is responsible for leading the team that underwrites and approves credit for companies from $5 million to $2 billion in revenues for the western United States. 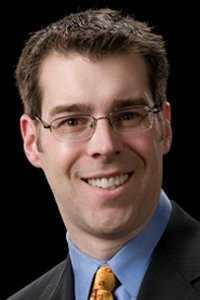 In addition, Schroeder serves as the Market President for the Seattle market. As Market President, Kerri is responsible for connecting the banking and investment resources offered through our eight lines of business to companies, families and individuals in Seattle. Kerri also leads the effort to deploy Bank of America’s resources to address social and economic concerns and build strong communities. Schroeder has 23 years of experience in the banking industry. Prior to her current role, Schroeder served for four years as the national credit executive for Bank of America’s Specialized Industries group which covers clients in the healthcare, education, not-for-profit, sports and restaurant sectors. Since joining Bank of America in 1999, she has held a variety of executive and management positions serving commercial clients. A first generation Irish-American, originally from Anchorage, Alaska, Kerri is an active member of the Seattle community having served on the board of directors of several non-profit organizations over the years, including most recently Atlantic Street Center, an organization that helps disadvantaged families raise healthy, successful children. She is part of the bank’s diverse leaders sponsorship program and is involved with The Global Ambassadors Program through Vital Voices. In addition, she is on the Steering Committee for the Power of 10 program, and she is on the Special Olympics 2018 USA Games Committee. Kerri is also is the executive sponsor of LEAD for Women in Seattle. She resides in Sammamish, Washington with her fiancé and their four sons. Michael Senske joined Pearson Packaging Systems in 1997. During his tenure at Pearson Packaging Systems, he has held a wide variety of positions including Director of Business Development and Vice President Sales & Marketing. Mr. Senske assumed the role of President in 2003. Prior to working at Pearson Packaging Systems, he worked in the Product Support Services division of the Consumer Division Unit at Microsoft Corporation. Mr. Senske graduated with a Bachelor of Arts degree in Psychology from the University of Washington, and he is a graduate of Harvard Business School’s Owner/President Management Program. Mr. Senske currently serves as the Chair of the Board of Directors of the Association of Washington Business (AWB). He is also on the Board of Directors of Colmac Holding Company. CEO & Chairman, Docker Inc.
Steve Singh is CEO and Chairman of the Board of Directors for Docker, the company that is transforming the way applications are built, shipped and managed. Before joining Docker, Steve was SAP’s President of the Business Network and Applications group with end-to-end global responsibility for new growth areas of the company and served on the SAP board of directors. Singh joined SAP in 2014 through the acquisition of Concur, which he co-founded. Concur, one of the first SaaS solutions on the market, is an industry leader in travel and expense (T&E) management. 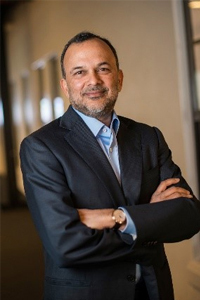 Before joining Concur, from 1993 to 1996 Singh was General Manager of the Contact Management Division at Symantec Corporation, an international technology firm focused on protecting information and computer systems. Prior to that, he co-developed ACT!, a pioneering contact management solution which was eventually acquired by Symantec. Singh began his career in technology with Apple Computer. Singh currently serves as chairman of the boards of Center ID and Talend. He is also a member of the boards of Washington State board of trustees for The Nature Conservatory, at ModuMetal, Dharma Platform, and the Singh Family Foundation. In addition, Singh is on the advisory board for the Foster School of Business at the University of Washington and is a strategic director in Madrona Fund V.
Meet the rest of the Washington Roundtable board members here. In ‘Around The Table,’ we highlight member news and share information on industry trends. This week, we shine the spotlight on Alaska Airlines, Comcast, Microsoft, and Pacific Northwest National Laboratories. 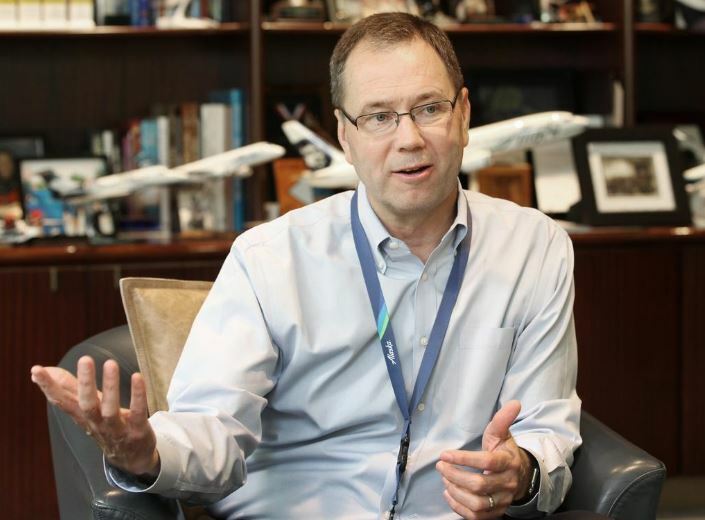 In an interview with the Puget Sound Business Journal, Alaska Airlines CEO Brad Tilden used boxing gloves and a frayed old carpet to discuss the company’s approach to intense competition and challenges. The boxing gloves were a gift from Brazilian aircraft maker Embraer after Alaska ordered 11 regional jets from the company. “They think they’re a company that punches above their weight, and they think Alaska is a company that punches above its weight,” Tilden said. The small square of frayed carpet was cut from company headquarters when old worn-out carpet was finally replaced. Tilden keeps it as a keepsake as a reminder to himself and to staff that low overhead matters. Read the wide-ranging interview here. 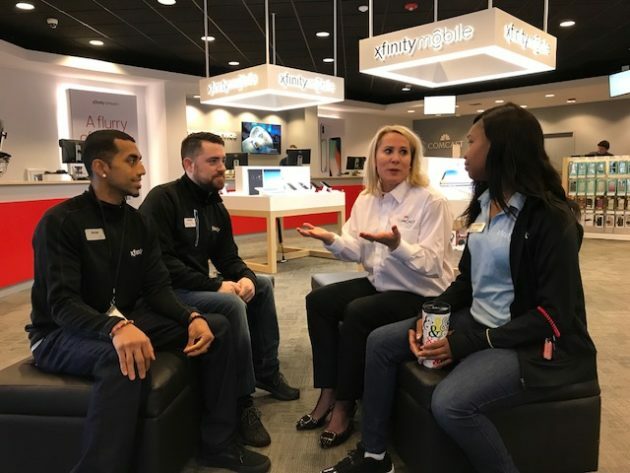 Amy Lynch, regional vice president of Comcast Washington and Washington Roundtable board member, was featured as GeekWire’s “Geek of the Week” this week. The regular column profiles the characters of the Pacific Northwest tech, science, games, innovation, and more. After a series of questions about her field, her inspiration, and daily routines, Lynch was asked what her favorite cause was. “STEM and women and girls,” she said. “It’s important that girls are encouraged at an early age to pursue things like science, technology, engineering and math. No field of study should be off-limits.” Read the full profile here. Microsoft Corp. on Monday announced it has reached an agreement to acquire GitHub, the world’s leading software development platform where more than 28 million developers learn, share and collaborate to create the future. Together, the two companies will empower developers to achieve more at every stage of the development lifecycle, accelerate enterprise use of GitHub, and bring Microsoft’s developer tools and services to new audiences. 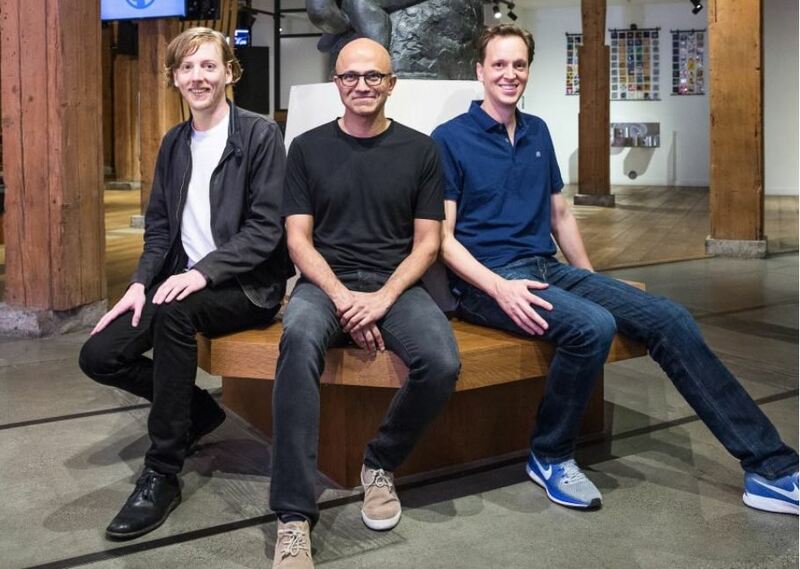 “Microsoft is a developer-first company, and by joining forces with GitHub we strengthen our commitment to developer freedom, openness and innovation,” said Satya Nadella, CEO, Microsoft. “We recognize the community responsibility we take on with this agreement and will do our best work to empower every developer to build, innovate and solve the world’s most pressing challenges.” Learn more here. 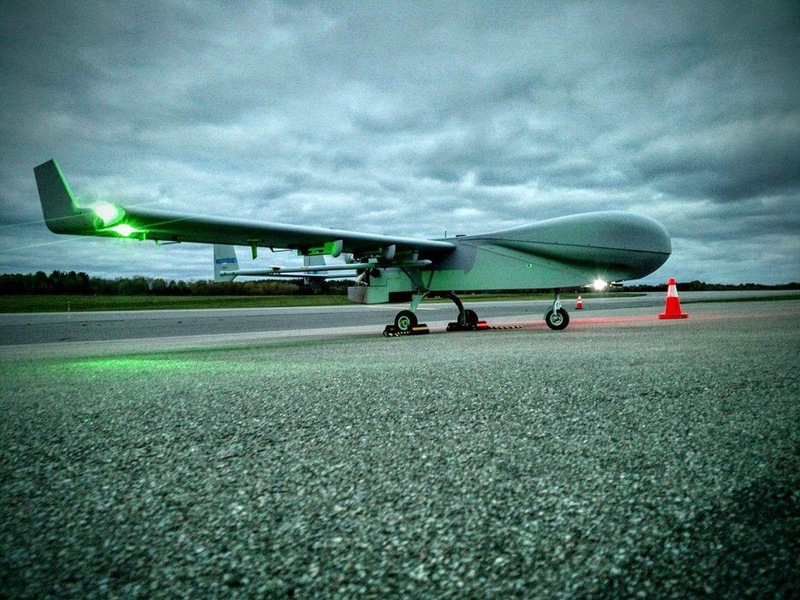 Credit: Navmar Applied Science Corp. The University of Alaska Fairbanks and the Pacific Northwest National Laboratory have signed a five-year collaborative agreement to advance research on hydropower generation, marine renewable energy and underwater technology development. PNNL and UAF’s Alaska Center for Energy and Power will form research teams, pursue joint funding requests and establish joint graduate student research and faculty appointment programs. “PNNL is proud to partner with the University of Alaska Fairbanks to address energy resiliency and national security challenges unique to our region, and to build upon existing collaborations in marine, environmental and energy research,” said PNNL director Steven Ashby. Read more here. Demand for workers with postsecondary credentials is higher than ever; 40% of Washington high school students earn a credential today. 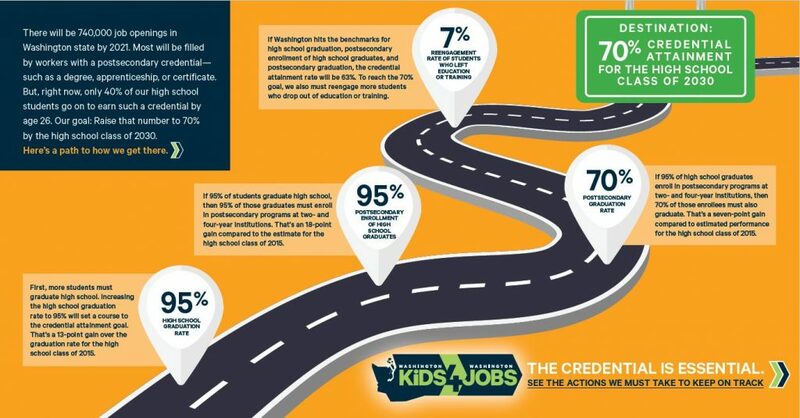 An estimated 40% of students from Washington’s high school class of 2015 will complete a postsecondary credential – such as a degree, apprenticeship, or certificate – by age 26, according to a new report from Washington Roundtable and Partnership for Learning. That number is up nine points from a reported 31% for the high school class of 2006. Washington is making progress in improving its credential attainment rate, though not fast enough. The state must more than double the average annual growth rate in credential attainment among its students to hit a 70% credential attainment goal set for the high school class of 2030. Among Washington high school students, the credential attainment rate by age 26 will go from 31% for the high school class of 2006 to an estimated 40% for the high school class of 2015. 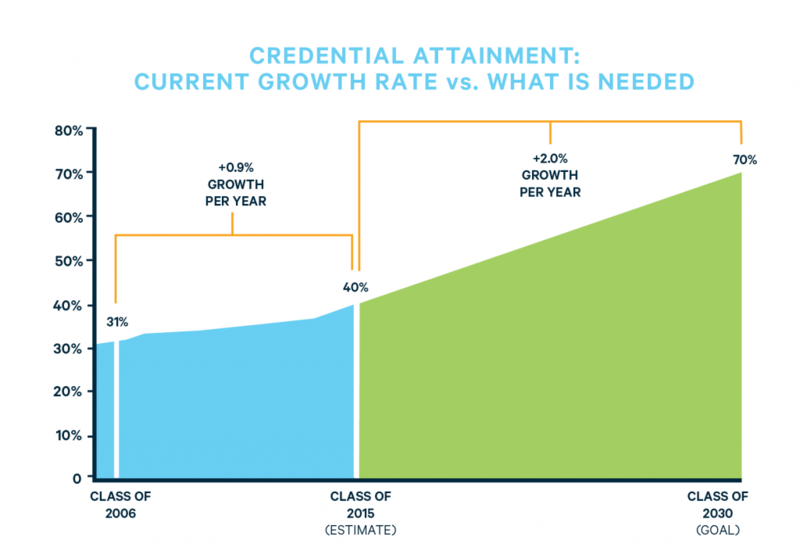 To reach the 70% credential attainment goal by the high school class of 2030, Washington must more than double the average annual growth rate in credential attainment – going from 0.9% per year to 2%. The high school graduation rate has been improving, moving from 75% for the high school class of 2006 to 82% for the class of 2015. Despite this improvement, the percentage of high school graduates enrolling in postsecondary education has remained stagnant. Closing race-, income-, and gender-based achievement gaps is essential. Credential attainment for white and Asian students is projected to be two to three times higher than that of Native American, Hispanic, or black students, depending on the subgroup. Also, just 31% of boys are projected to complete a credential by age 26, compared to 47% of girls. This report is the third in our “Washington Kids for Washington Jobs” series. Visit us online to download the report, fact sheet, infographic, and more.